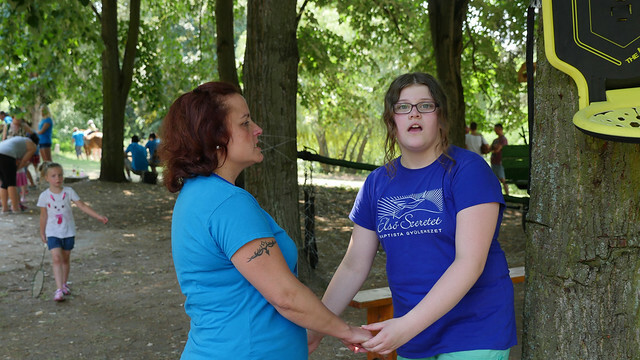 Above: Noémi giving her testimony on Sunday before being baptized by faith into Jesus Christ. 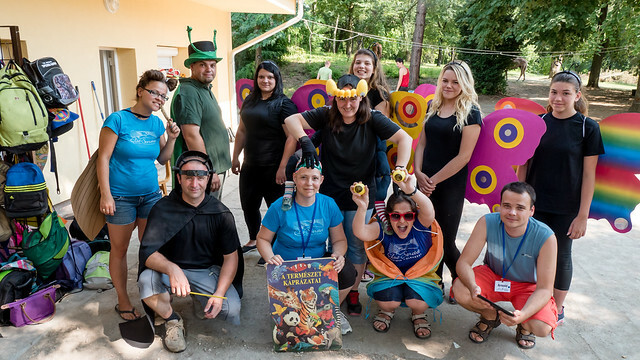 As I’ve mentioned in previous posts, Noémi’s daughters attended our Vacation Bible School (VBS) this summer for the first time. On the last day of camp, the parents are invited to attend and we prepare a special small group for them where we share what we’ve been sharing with their kids throughout the entire week. 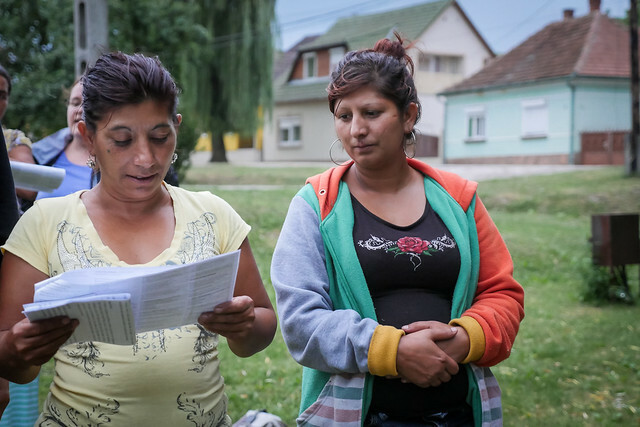 It was clear that in this small group Noémi was already being drawn to Christ and afterwards she spent time with pastor Dezso talking more about what it means to become a Christian. She prayed with Dezso and put her faith in Jesus that day! Before our worship service began this past Sunday, I saw Dezso talking with Hajni (above) in the corner of the room. I knew from previous conversations with Dezso that Hajni was close to making a decision. I saw them bowing their heads and praying! Although we didn’t know beforehand, now we had two who were being baptized into Christ! “I had the normal life with a family, work and money. I thought the more money I could get, the happier I would be. But on December 19, in 2013 I had an experience that changed my life. I had an accident. A woman rushed out in front of my car. Instead of 40, I was going 54 and it seems her intention was to commit suicide. She died right there. Shortly before this happened I had been at a gas station and ready to continue on my journey when I heard a voice, “Don’t go!” At that time, I just ignored the voice. As I continued down the road, I heard the voice again. “Stop!” I didn’t pay any attention, and 5 seconds later the accident happened. After this, I was in the hospital with my son. And I just thought and thought about that voice. Where did it come from? Who’s voice was it? It was this experience that made me realize personally that there was something more than this material world. Praise God for drawing both of these women to Himself and revealing that only in a restored personal relationship with Him could they find the life they were missing. It was a great worship service and we were thankful for visitors that attended to witness this baptism. Noémi’s husband Attila attended along with Attila’s mother. Above: Orsi embracing Hajni. 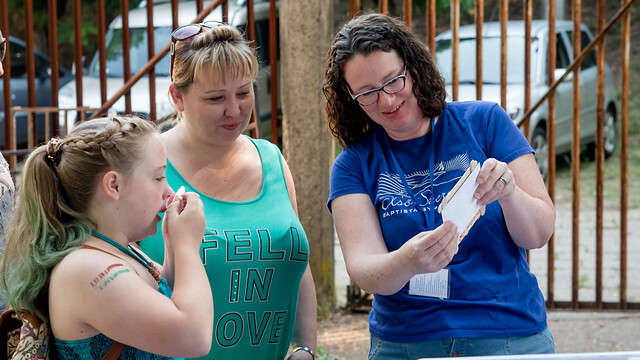 Orsi who was saved last year soon after attending VBS was mentioned by both of these women as having a part in helping them find the help they needed to be saved. Above: Noémi with her mother in law. 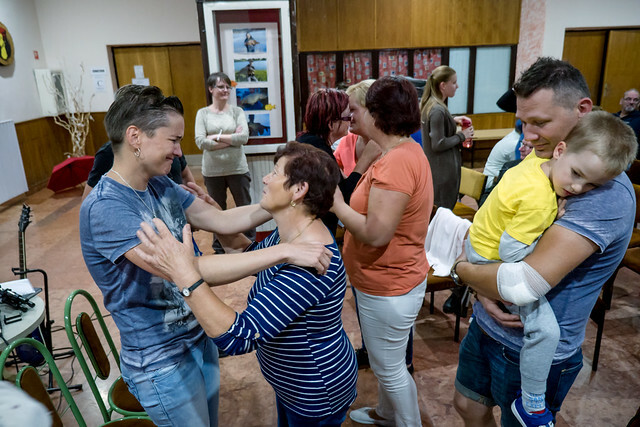 Noémi’s husband Attila can be seen holding his son in the yellow shirt. English Camp starting next week! Above: A group picture from last year’s English Camp in Lakitelek. This camp has proven to be a very effective tool in reaching the youth in the areas we are seeking to plant churches. 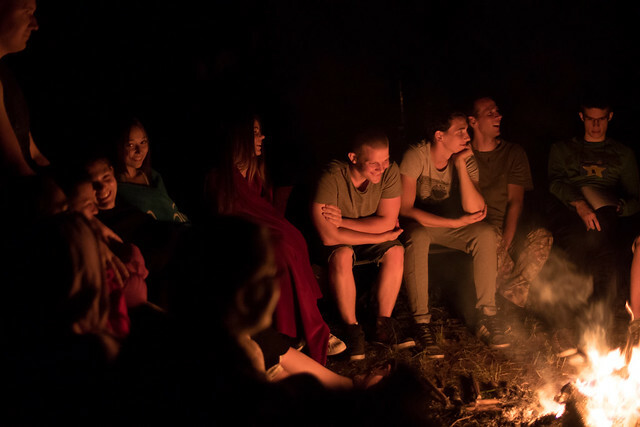 It is here that they have an opportunity to truly escape the everyday distractions and constant deceptions that seek to keep them from knowing God. We bombard them with Christ’s love and the Holy Spirit has touched so many lives through the years. 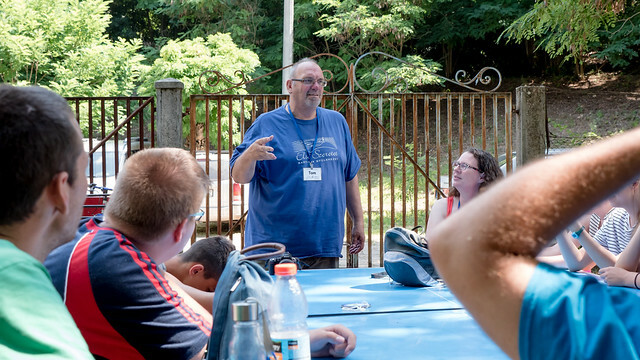 Many who have been saved at this camp in years past now serve with us as translators and they also have opportunities to share their testimony to newcomers. This is an intense time of ministry and we could use your prayer support. Please contact me if you would like to partner in praying specifically for this English Camp ministry. I will then send you a link to a blog that will include daily updates and prayer requests from camp. Contact me by clicking here. 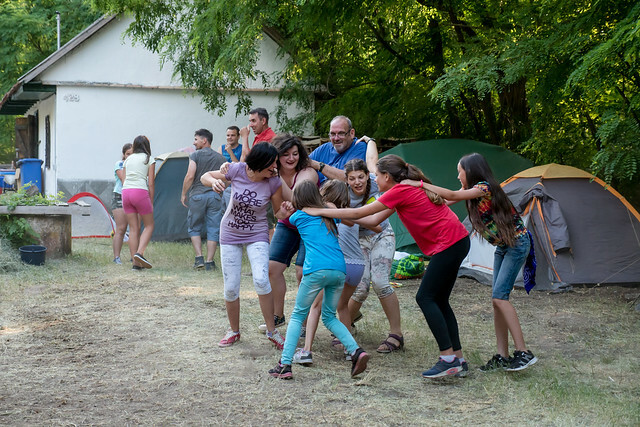 Above: Pastor Dezso helping one of his daughters set up a tent in Jászfényszaru this past weekend. 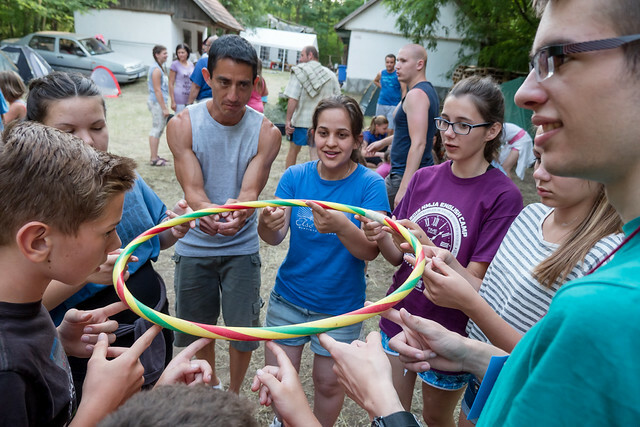 Just a handful of days after concluding our VBS, we invited pre-teens and teens to a few days of camping in the town of Jászfényszaru. Our goal is to keep the momentum and the conversations going that have begun at VBS for these older kids who are in a different stage of life. Our subject for teaching and testimonies throughout the weekend was focused on a godly perspective of singleness and also testimonies of how various members in our church met and decided to marry. Above: Robin (center) has had a year full of challenges as he was sent away to foster care for a time because of behavioral issues. 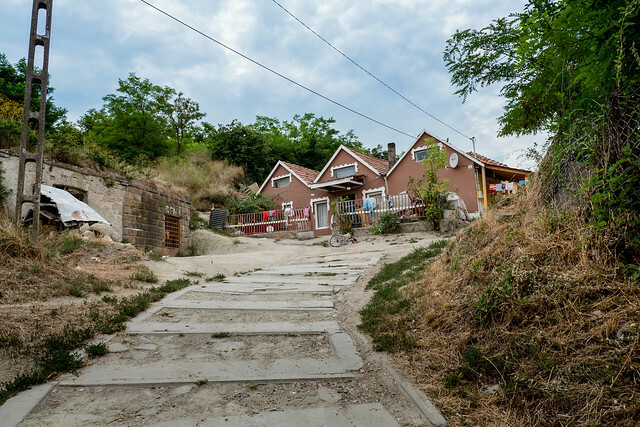 After some time, he moved back into Petofibanya with relatives and he has a long history with various members in our church seeking to reach out to him. Since returning and attending VBS and this teen camp, we’ve seen a change in his heart. Please pray for Robin to grow in his faith in Jesus. 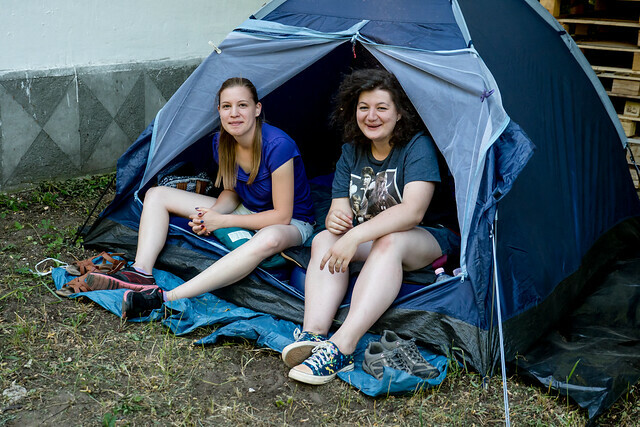 Above: Eszti and Bogi all set up for our first day of camp. This is sacred ground for Bogi as last year this was the same place where she finally made a decision to put her faith in Jesus Christ. 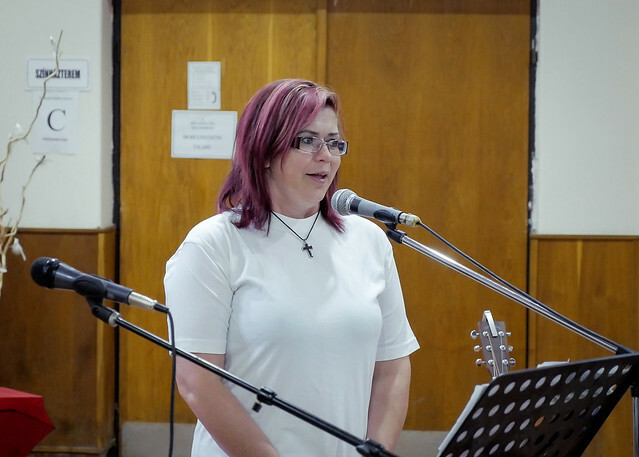 Now this year Bogi is serving with us with her own personal relationship with Jesus. 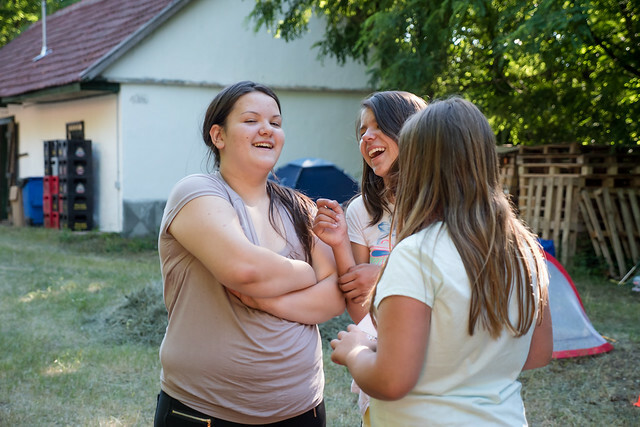 Above: Janka (center) is one of the girls who made a decision to put her faith in Jesus at our VBS just a few weeks ago! 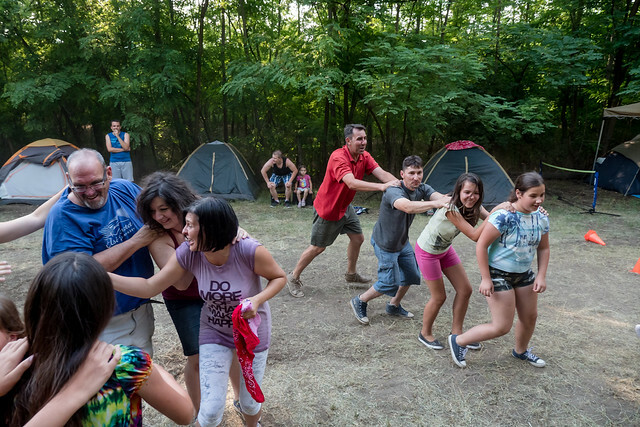 Above: Béla (red shirt) is Janka’s (pink shorts) father. 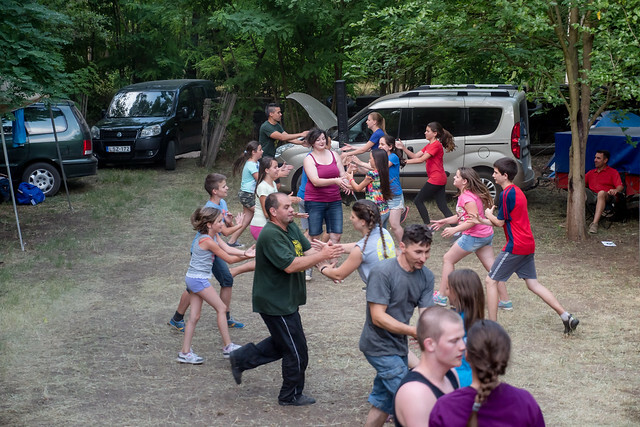 Because of a misunderstanding, Béla ended up attending this camp with his daughter Janka even though he was not required to be there. 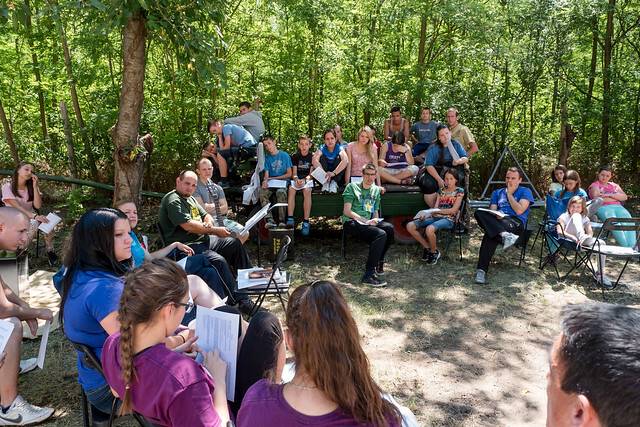 Just like the VBS, God used this camp not only to reach out to the kids but to parents. Teammate Miki spent significant time having ‘gospel conversations’ with Béla. Béla has attended our church off and on in the past and seems to be understanding more and more as he continues to spend time with us. 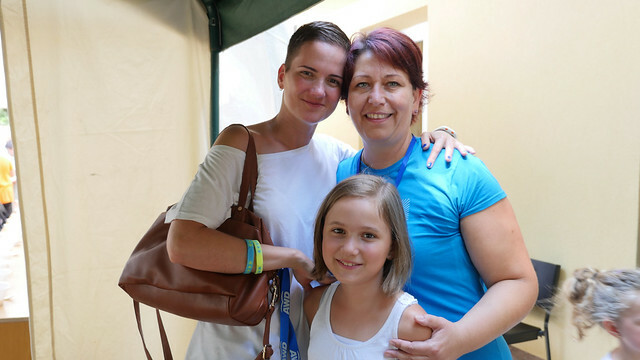 What a joy it would be to see Béla come to know Jesus soon after his daughter Janka! Please pray for Béla. 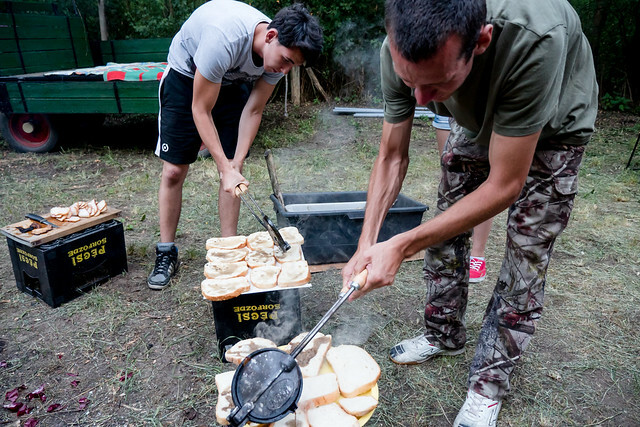 Above: Hungarian camping staple food…bread covered with fat drippings and topped off with onions and tomatoes…excellent! 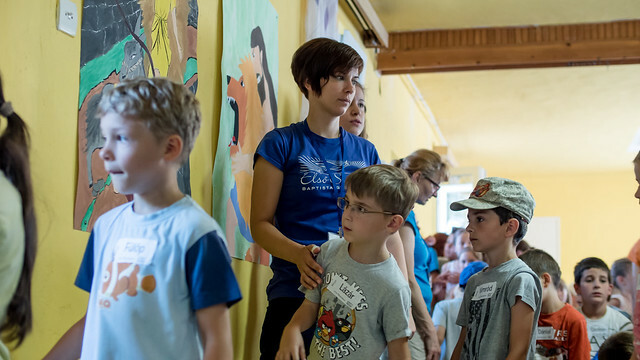 Above: Mira (left) also attended our VBS. She opened up in one of our conversation times and shared how she now sees the difference between what we are teaching from God’s word about relationships and the example (negative) she has seen her older sisters live out in their families. It was a great weekend with God using various testimonies and teaching from His word to help these teens see God’s will and God’s way that is always better than the world’s way. Please pray that the lessons learned at this camp would help these teens make good decisions that bring blessing to them and glorify God. Above: Angela with her granddaughter Dori. Dori is wearing a bracelet she received last week from Zsofi who was able to explain the gospel in basic terms with her. As you may recall from my previous posts, Angela had been wrestling with the decision of who to trust in regards to teaching about God. As we brought pure Bible passages to study together over the the past weeks, it became clear to Angela that the sect that had been visiting her for over 10 years had left out the importance of knowing Jesus Christ personally as Lord and Savior. A few weeks ago, before we left, we prayed together and she asked for prayer for Jesus to truly show her the way. Jesus gave her strength to tell the others to no longer visit her and that she no longer wanted anything to do with them. They continued to call her that week and even (uninvited) sent two senior members of their group to try to convince her to remain with them. But Angela made up her mind and the next time we met her face was brilliant with joy as she shared her decision with us. As we made our way to Angela’s house tonight we ran into Erika who was baptized last year but soon after fell out of fellowship for various reasons. This was disheartening to all of us because Erika seemed to be one who was truly grasping God’s word and seemed to understand spiritual truths more than any other. Erika was heading the opposite way pulling a bike along with her. We rolled down the windows in the car and greeted her. This must have been a surprise because she did not leave on good terms, although we always made it clear to her that we were praying for her and would always welcome her back. Her right leg was bandaged and she was clearly having trouble walking. We invited her to attend the Bible study at Angela’s house and she joined us. 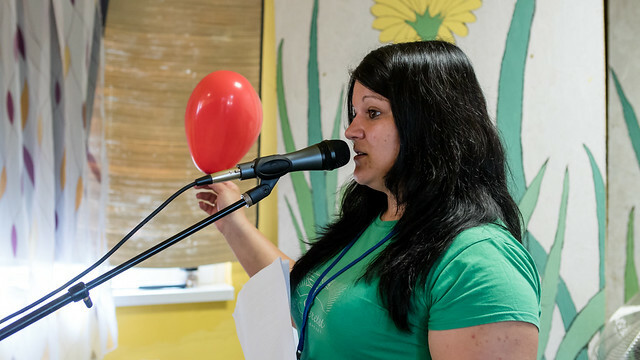 It turns out that Erika had a serious blood clot in her leg and problems with blood circulation that required further visits to the hospital and various medication. Before she left, we offered to pray for her healing which is nothing new for Erika. Last year, Jesus healed Erika of a shortened leg that the doctors said could only be fixed with surgery. As we talked about her life over the past few months, she realized that Satan was seeking to derail her faith and pull her away from fellowship. 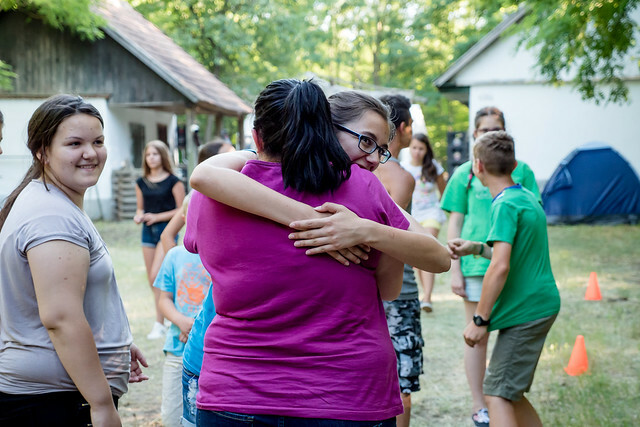 We encouraged her to find a way to remain in fellowship with the believers in Bogács no matter the cost. 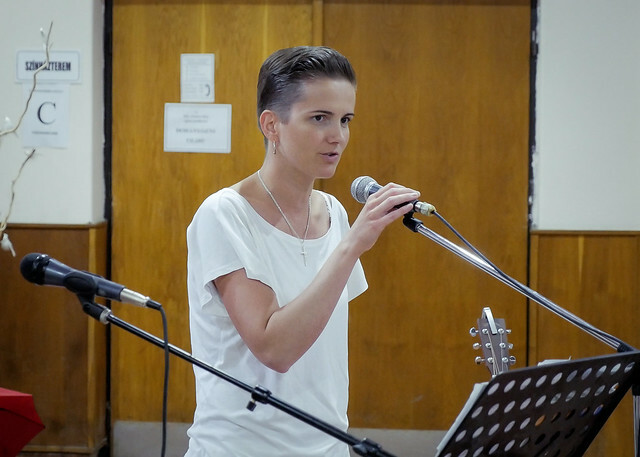 Before we prayed for Erika, Angela lit up as she began sharing her testimony of how Jesus healed her leg. 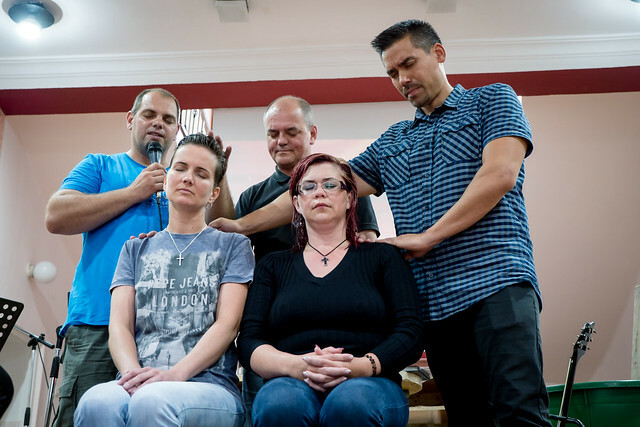 Angela shared that Jesus not only healed her leg that she had suffered with for a year (and the doctors told her there was no cure), but a recent blood pressure checkup revealed that her blood pressure is totally normal after years of problems. She shared that she just feels free on the inside now and has been set free from depression. She recognizes that all of this has happened because of Jesus. We then took some time and prayed for Erika’s healing. She said the pain she was in was gone. She took off the bandages and began walking. She sat back down and said, “Let me check something. The doctor said if I can lift my leg up while sitting down then I’ll know it is better.” She raised her leg up off the chair with no problem. Praise Jesus for His mercy and this gift of healing and restoration to a daughter that had drifted away. We pray that this will be the beginning of Erika returning to follow Jesus with us by faith. Would you pray for Erika as this journey will require her to make touch choices and she will face much opposition from family and the community. Above: Noémi is preparing for her baptism this Sunday! 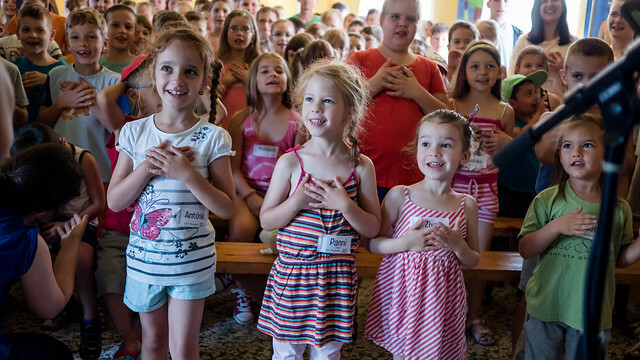 Noémi’s daughters attended VBS a few weeks ago and on the last day where parents are invited to attend, God helped Noémi see her need for Jesus as Savior and Lord. She has continued to meet with various members of our body and is planning on being baptized into Christ on Sunday! Please pray for Noémi and also her husband Attila. Attila is open to the Gospel, but not in the same place as Noémi spiritually. Pray also for others who have been visiting our church since VBS to be convicted through the work of the Holy Spirit, the testimonies given and the word preached this Sunday. 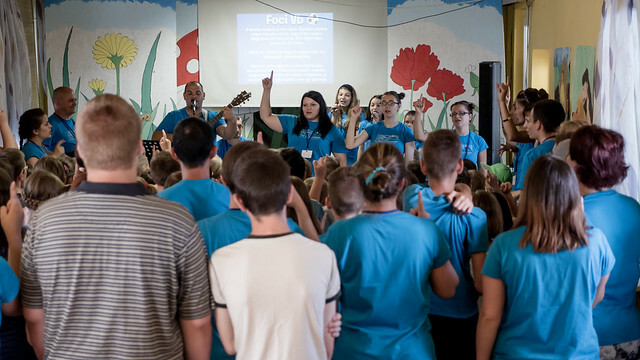 Above: We had 40 volunteers this year serving in various ways in our VBS this year. It is a joy to serve with so many that clearly love Jesus and desire to share His love with these kids. 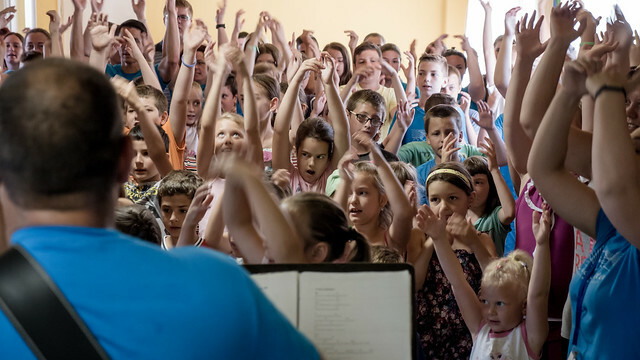 Above: As we’ve come to the last day, the kids now know all the songs by heart and were enthusiastically participating in our last morning meeting. Above: Praise God for bringing many parents on Saturday. Above, you can see Dezso leading a small group time just for them and explaining what Christianity is all about. Arnold and I also were able to share out personal testimonies of how Jesus saved us. It was clear that there was one particular woman, Noemi, that was very active in the group and interested in hearing more about what we were sharing. Above: As the day continued, Noemi was more and more convicted as she spoke to various workers about a personal relationship with Christ. She sought out Dezso to talk more about what she should do. Noemi’s husband was also present, but confessed that he was not ready to take any steps like his wife. Soon after, Noemi decided to put her faith in Jesus! 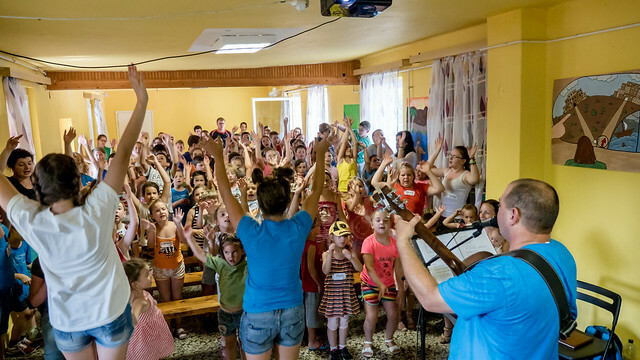 We have never had this happen at a previous VBS, but rather in days following. Praise God for sending His Spirit to bring conviction and understanding to Noemi so that she could become a child of God through faith in Jesus. 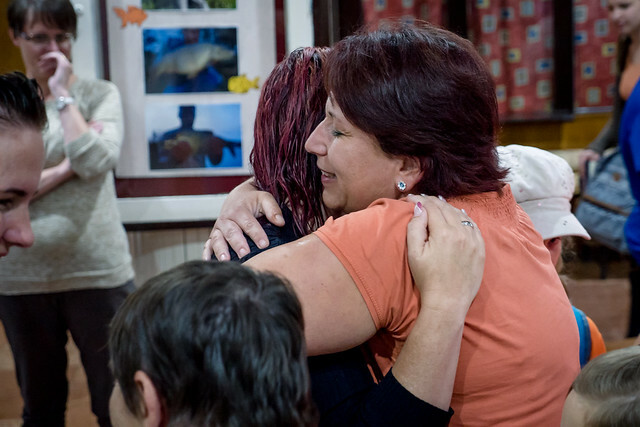 Above: Noemi with church member Orsi. 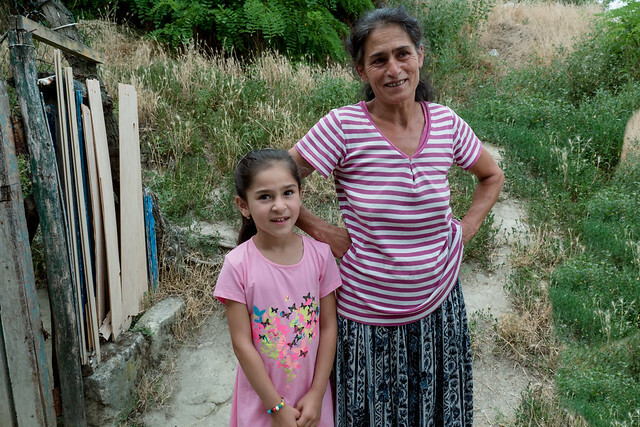 Praise God that she already has a connection with Orsi and will have someone to help her in her first steps of faith in Jesus. Above: There were also other parents that continued to have more conversations with Dezso throughout the day. Pray for them that the seeds that have been planted in their hearts would grow and that they would continue to be drawn to God. Above: Erika talking to Janka about the Gospel after she was asking more and more questions in small group today. Above: Csenge who is also in Janka’s small group was also convicted in her heart and I found out later that both Janka and Csenge made decisions to put their faith in Jesus. Csenge’s grandmother, Edit is already a church member and is serving with us at camp and will be a great support and encourager for Csenge! 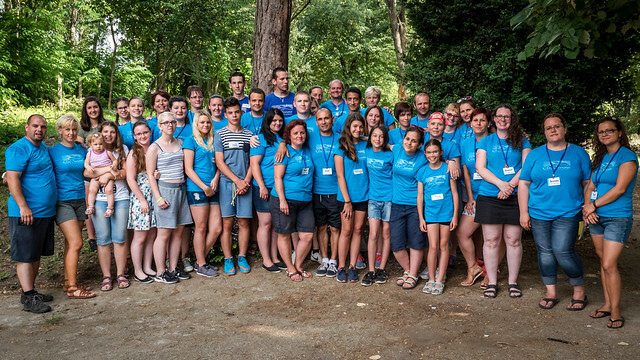 Above: Józsi, who became a believer soon after last year’s VBS has been a great servant in this year’s camp. On Saturday, as I returned from playing soccer in free time with a group of kids, Józsi approached with a smile. 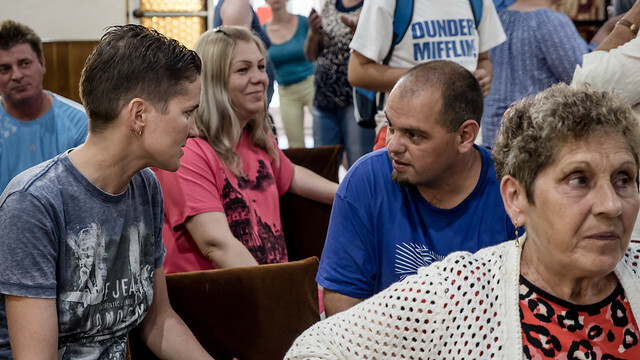 He said, “I just shared the Gospel with two people!” Józsi was full of joy and so excited that God was now using him to share the Good News with others. Above: At Sunday’s worship service, Noemi attended with her daughter. Noemi has informed us (with excitment) that she wants to be baptized! Above: This grandmother, Irén, is the primary caretaker of her grandaughter (in pink) Barbi. Irén was one of our neighbors many years ago before we moved to a different house. She enjoyed VBS and this was her first visit to our church afterwards. She told me afterwards how much peace she felt being with us and that she is now going to begin attending. She said she reads her Bible at home, but it was different with us. She said it was if she could understand it in a much deeper way. Pray that she come to understand that the peace she is experiencing is from the Prince of Peace, Jesus Christ. Pray that Irén come into a personal relationship with Him and continue growing as she remains in fellowship with believers. What a great camp! God has done amazing things! 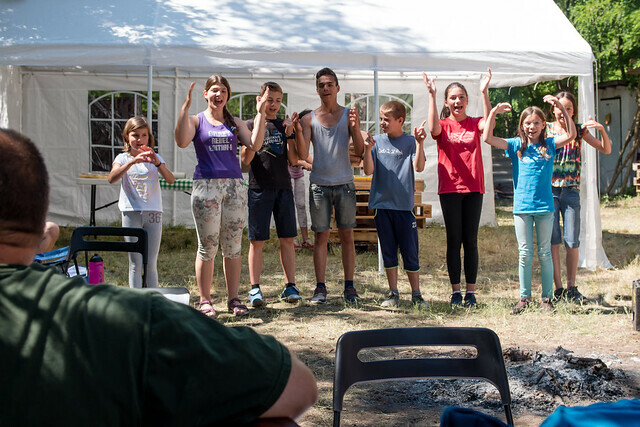 Campers Zalán, Feri, Janka, Csenge and one of the parent’s Noemi have put their faith in Jesus. 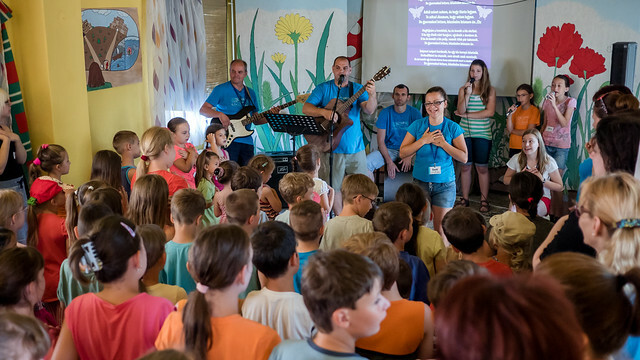 Praise God for the gift of His Son and the grace He has poured out throughout this VBS. Thank you for your partnership in praying for this ministry. Rejoice with us in all that God has done. Here are a few films to give a better sense VBS. Enjoy! Above: Today Eniko did a great job explaining our need for a new heart that only God can give to us through Jesus. Above: Jennifer helping usher the kids out for their morning snack. Unfortunately, Jennifer’s youngest son, Justin contracted shingles from another child in his small group and had to stay home. Please pray healing for Jennifer’s son Justin and the other child Csenge who had to remain home as well after finding out she had shingles. 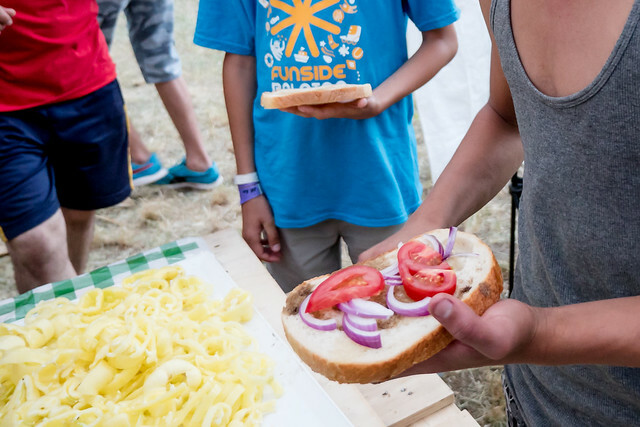 Above: These two kids were not originally registered for our camp, but we invited them in a few days ago. 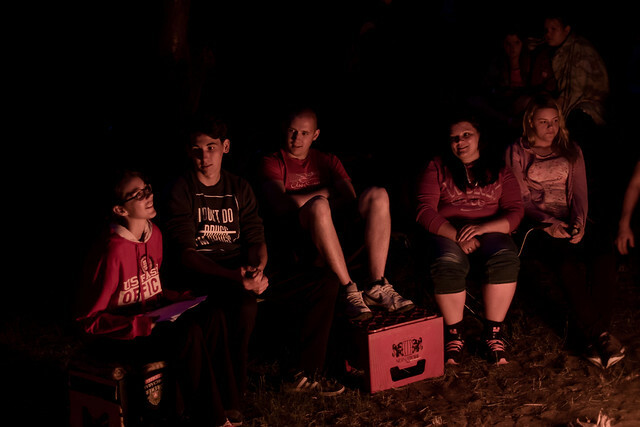 Unfortunately, they began misbehaving and disregarded the rules we have in place to keep everyone safe and having a good camp together. We sent them home yesterday. This morning, the younger one returned to the gate of our camp with his grandmother and Dezso was able to explain the reasoning behind having to send him home. He asked for a second chance and we allowed him in. Soon after, his older friend came bicycling up to the gate and burst into tears because he also wanted to return. 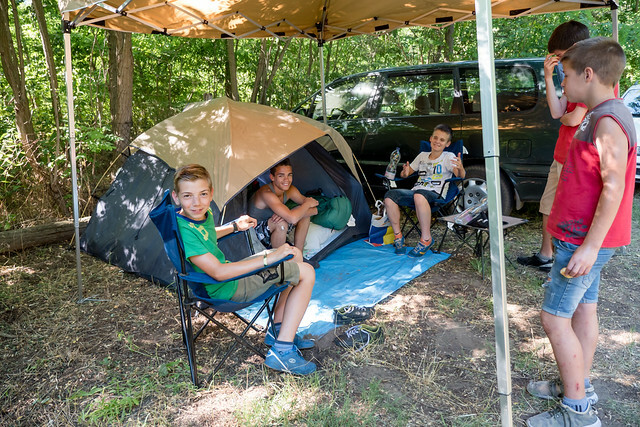 Dezso explained that this time around he would have to abide by the same camp rules as all the other kids and he readily agreed. Praise God that they remained the entire day and had a great time. Above: The cast of this year’s drama for our VBS. Today, they performed the conclusion with the caterpillar realizing the error of his ways and choosing to do what “The Book” says to become a butterfly. Throughout the week, we’ve tied this parable together with God’s provision of a transformed life to those who turn from a life of ignoring God’s will and put their faith in Jesus Christ to become a new creation. Tomorrow is a very important day as we conclude our VBS with an open invitation to all the parents to attend and spend the day with us doing all the things that the kids have done throughout the week. We’ll be reviewing the Bible stories we learned and have a special small group just for the parents. 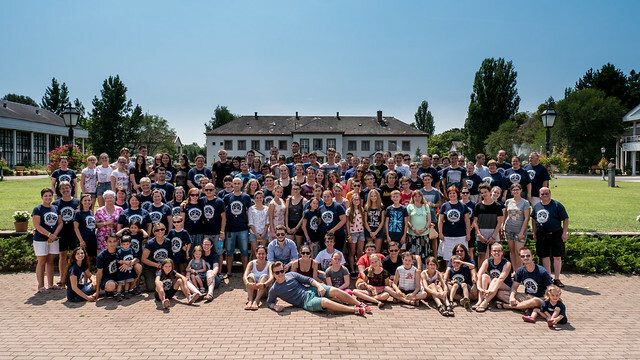 It was this day last year that touched parent’s of kids that are now serving with us this year. They were touched by testimonies and through continued follow up were saved by God’s grace. Please pray that this would again be the case this year as many parents come to visit. Pray that the Gospel be presented clearly and that entire families would begin following Jesus by faith.